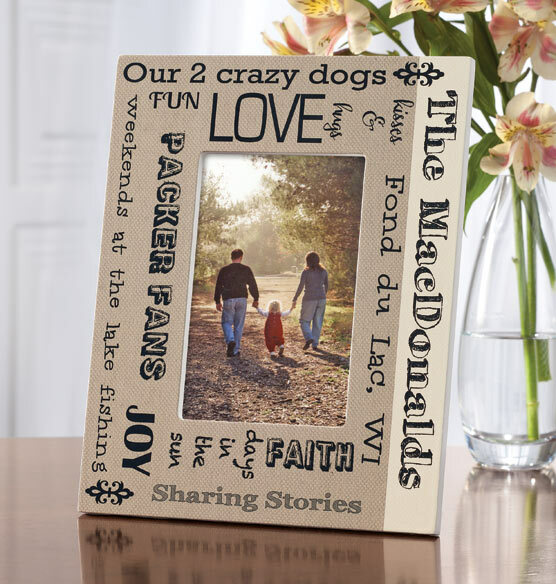 Tell your family’s story by expressing the things they love with this Family Story frame. 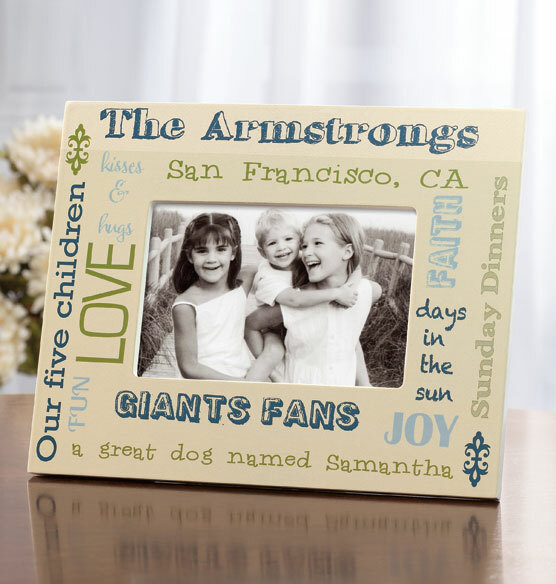 Add family interests, location and other details to the pre-printed sentiments, and create a unique picture frame to show your family pride. 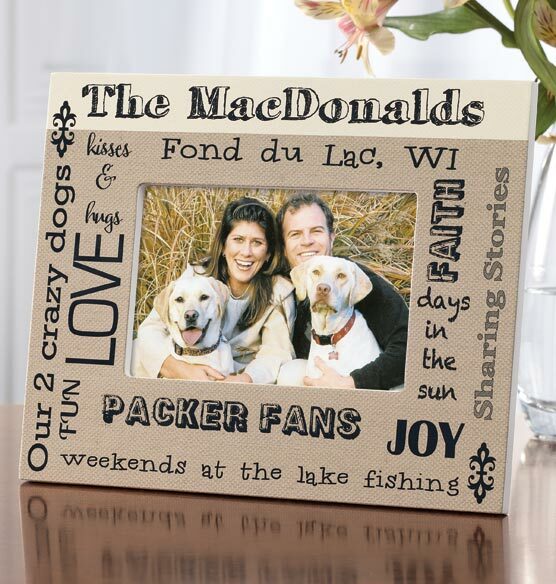 Place a favorite family photo inside, and enjoy this fun way to share tidbits about your clan with others. Makes a great gift idea. I was very pleased with this frame because it presented family highlights and interests in a very clever way and it made a wonderful anniversary gift for my daughter and her husband. I was also pleased with the quality and design of this frame. Definitely a winner. I love this frame...you can use the guidelines to customize locations and trips that you may have taken, for yourself or another family member. But I chose to make them into graduation gifts, substituting in the college name and other short memories for my nieces and nephews, and placed a picture of them from their graduation in there. They were a huge hit! Had to return because of errors in spelling & placement of names! Had Help in reordering & correcting the errors but, still was sent with different errors. I gave it to my sister as a gift for her surprise party the way it was it was too late to do it over for the third time! There should be a diagram to show exactly where your chosen names or words will go & set up! It is every confusing the way they are just numbered and lined up. It could be a very personal and unique gift if the finished product was dependable! It gave me many options to customize. This unique frame completes your special family photo. family is VERY important to me and this little frame encompasses the spirit of a solid family. I LOVE IT! Great quality! Easy to personalize online. 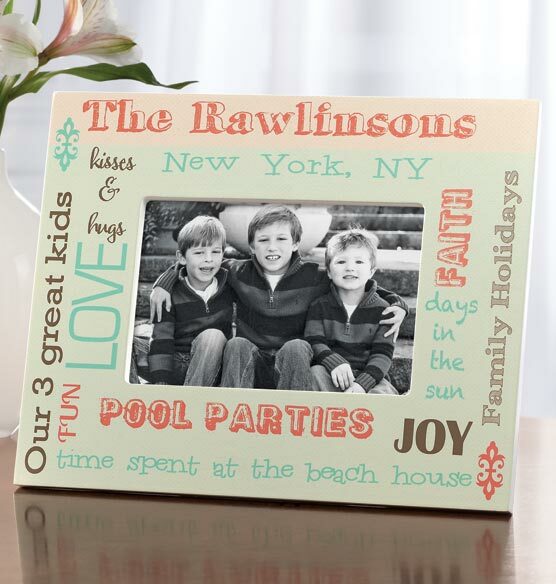 I wanted to give a personalized picture frame and the look and price of this frame was ideal! I purchased one for myself and love it! I had a couple of pictures of my granddaughters when they were younger and wanted to put them in this frame with little personal comments referring to each of them....a fun memory! Had been looking for a frame for a 50th wedding anniversary and this was a perfect fit!! I WOULD LIKE TO SEE THE FINISHED PERSONALIZATION ON THE FRAME BEFORE I PURCHASE IT? BEST ANSWER: Thank you for your question. Unfortunately at this time we do not have an option to show what the finished product will look like with the personalization. We apologize for any inconvenience. Am I able to use Chinese Characters for one line? BEST ANSWER: Thank you for your question. Those characters are not available. We apologize for any inconvenience.